Kuala Lumpur Infrastructure University College (KLIUC), Malaysia. The general problem confronting science education is the inability of students to see the phenomena being taught which often leads to an inability to learn basic principles and to see their practical relevance to problems in real life (UN, 2003). The effort of introducing space related technologies and remote sensing had been carried out at school level by some developed countries with advanced technology in space technologies such as educational program by NASA, USA (NASA, 2008) and SAREPTA, Norway (Sarepta, 2008) just to name a few. This has not taken place in many developing countries partly because the benefits of space science and technology have not been appreciated enough and partly because the facilities and resources for teaching science and technology at educational level are not yet well developed (UN, 2003). In Malaysia, due to the lack of expertise, facilities and the late realization of the technology, remote sensing education had fairly a late start in universities (Kasturi et. al, 2000). As space exploration will be very important in the 21st century, space education and awareness must be instilled to the public in Malaysia. Promotion of space science education activities such as remote sensing, satellite communication and astronomy is an ongoing task. Agensi Angkasa Negara (ANGKSA) or the National Space Agency (NSA) of Malaysia, Malaysian Centre for Remote Sensing (MACRES), now known as Agensi Remote Sensing Malaysia or Malaysian Remote Sensing Agency and universities jointly organize the space science education awareness program for the public to understand (Zambri, 2007). Again, it was highlighted that universities must play their role in constructing a solid curriculum on space science education and awareness and an integrated space science education and awareness programs for teachers, students and the public shall be a well planned approach (Zambri, 2007). Hence, the proposal of the EGRS is to introduce space science to complement but not to change the syllabus in the hope of creating interest and innovation besides introducing broader spectrums of space science education content to primary, secondary schools and tertiary level who would become the future innovative Malaysians. 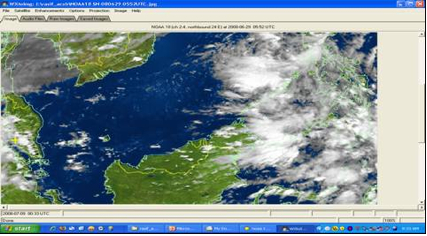 NOAA weather satellite imagery is a remote sensing technique for collecting information of the Earth and its environment related to weather forecasting from satellite. NOAA imagery not only contributes to weather application but also to other applications such as oceanography and agriculture. This effort helps to create awareness in school children about Mother Nature and its environment by observing real time climatic changes from space and in practical to relate to the real happening on the ground. It is not a surprise when children in developed countries being ambitious in space related technologies to become astronauts because they have been given the opportunity to think and work like scientists at an early age of education. To create the same awareness in school children in the country, thus EGRS is taking the opportunity to become a platform to inculcate the culture of being innovative and creative by introducing the NOAA imagery to school children. NOAA series of polar satellites have been continuously imaging the Earth and transmits the data regularly and freely via the Automated Picture Transmission (APT) and High Resolution Picture Transmission (HRPT). In this effort, only an APT system would be developed, as it would provide a system at an affordable cost for educational purpose at school level. EGRS is proposed to be introduced at secondary level, as the technology requires basic knowledge in physics, mathematics and related science subjects. But this does not stop the primary school at a much younger age to enjoy the system but with the right guidance from teachers. 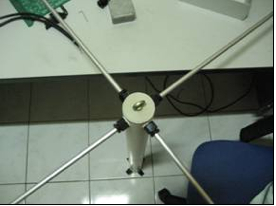 In order to create interest in innovation and scientific environment at school level, the EGRS will introduce the gizmo in kits form to provide hands-on for teachers and students to setup some part of the receiving system of which the antenna requires minimal supervision for installation by the developer. This will create a better understanding of the system for the students besides appreciating and generating interest in the system and other technology spin off from the system. Again, in kits form, the EGRS would be an affordable system for all schools to procure. NOAA operates two series of remote sensing satellites: the Geostationary Operational Environmental Satellites (GOES) and the polar orbiting environmental satellites. This study focuses on the second system of the sun-synchronous polar orbiting satellites that carry the Advanced Very High Resolution Radiometer (AVHRR) which records electromagnetic energy in the five bands summarized in Table 1. The AVHRR data were developed for meteorological purpose that can also be used to map vegetation and sea-surface characteristics over large regions (Jensen, 1996). The AVHRR sensors image the entire earth twice each day thus making it possible to monitor change in land-cover conditions over short periods. The AVHRR satellites orbit at 861 km apogee (845 km perigee) above the earth at an inclination of 98.9° and continuously record data in a swath 2,700 km wide at 1.1 x 1.1 km spatial resolution at nadir. An odd-number satellite (e.g. NOAA 15) crosses the equator at approximately 2.30 pm and 2.30 am while even number (e.g. NOAA 18) crosses the equator at 7.30 pm and 7.30 am local time. Two types of spatial resolution can be acquired from NOAA series: the 1.1 x 1.1 km data or Local Area Coverage (LAC) data and the 4 x 4 km or the Global Area Coverage (GAC). This study emphasizes on the APT system that can capture data sampled at 4 x 4 km or the GAC data. Normally, two NOAA-series satellites are operational at one time (one odd, one even) with each satellite orbits the earth 14.1 times daily (every 102 min) and acquires complete global coverage every 24 hour (Jensen, 1996). evaluation on the system in achieving the objective of creating interest in innovation and scientific environment at school level, and as VAPs in complementing existing syllabus in education. The signal acquisition level consists of the development of the antenna, low noise amplifier, receiver and tracking software. The antenna is to receive the electromagnetic radiation (EMR) in radio frequency (RF) signal. The RF range to be received is between 137 to 138 MHz. 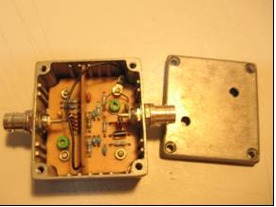 The LNA is to amplify the incoming RF signal and feed it to the receiver. The receiver is to demodulate (extract information) the received signal and transform it into audio format. 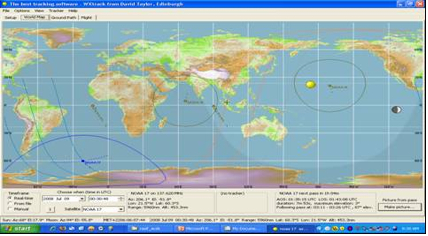 The tracking software is required to determine the satellite path and pass for acquisition schedule. Figure 5 shows the WXtrack tracking software that is made freely available from the internet (David and Cecilia, 2008). Two types of acquisition option can be provided. For educational level, the human intervention is proposed to allow for interactive students’ activity during data acquisition. Students will use the tracking software to determine the satellite path and pass for acquisition schedule. 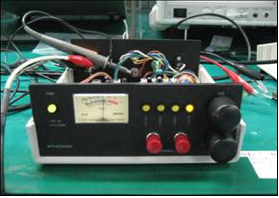 Again, students will have the chance to select and control the frequency using the receiver to demodulate (extract information) the received signal and transform it into audio format. The fully automated acquisition will allow for pass control in the absence of human intervention. 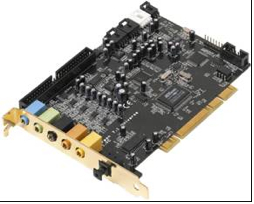 This option provides satellite monitoring by emitting the signal from the serial port to instruct pass control hardware to switch to the appropriate frequency of the passing signal. The conversion level is to convert the audio signal received from the receiver to digital format (A-D conversion). The processing software is required to process the digital format into image format as shown in Figure 7 using the WXtoImg processing software. For the EGRS which receives the APT, only visible (VIS) & near-infrared (NIR) bands are acquired during day time acquisition while NIR band for night time acquisition. Number of acquisition per day and night is 12 passes to provide 12 data set. Some preliminary results were obtained by the system during the development phase. Figure 7 a show data captured from NOAA15 satellite on July 2, 2008 at 2147UTC while b shows data captured from NOAA17 on May 4, 2008 at 1458UTC. The study proposes for the system to be installed and operated at selected schools with the objective of getting early comments and review from teachers and students on the effectiveness of the EGRS in achieving the objective of creating interest in innovation and scientific environment at school level. For a start, the system will be established in Kuala Lumpur Infrastructure University College (KLIUC) as a tool in teaching remote sensing under the Geomatic Engineering program, Civil Engineering Department, School of Engineering & Technology Infrastructure (SOETI) as contributed by Axis Commerce Sdn. Bhd., the developer of the EGRS. At school level, teachers will be provided with training in fundamental remote sensing and guides to (i) install and operate the EGRS, and (ii) extract information from image data. Thus, fundamental remote sensing is a pre-requisite for teachers to understand before exploiting the image data. Upon completion of training, teachers will then be capable of (i) managing the students to operate and maintain the EGRS, and (ii) educating remote sensing to students and extract information from satellite imagery. Comments and review by teachers will then help to refine the system and training guides before proceeding to the last stage of awareness and launching the system to other schools interested in EGRS. NOAA satellite for weather is related to remote sensing of the atmosphere which attempts to quantify numerous variables: cloud coverage and identity, water vapour concentration and precipitation rate, wind speeds, atmospheric aerosol and trace gas concentrations, and even lightning in storms. The term atmosphere has led to the creation of several other words to describe various divisions of the Earth’s environmental systems. The hydrosphere, encompassing oceans, rivers, lakes and snow and, ice on both land and sea. The biosphere, referring to the living things that inhabit the Earth, which for remote sensing purposes primarily means land vegetation and oceanic phytoplankton. The geosphere, covering such areas as the Earth’s radiation budget, the physical topography of the continents, geological processes that modify the land surface, the dynamic activity of volcanoes and the movement of the Earths’s continental plates. The anthroposphere, meaning the influence of humanity on the surface of the Earth through structures and activity that have the potential to significantly alter the Earth’s climate (UN, 2003). Thus, the introduction of EGRS would benefit education in various applications besides allowing the students to understand the fundamental of remote sensing. At school level, specific educational modules would be designed according to the primary processes that remote sensing seeks to measure in some of these spheres. 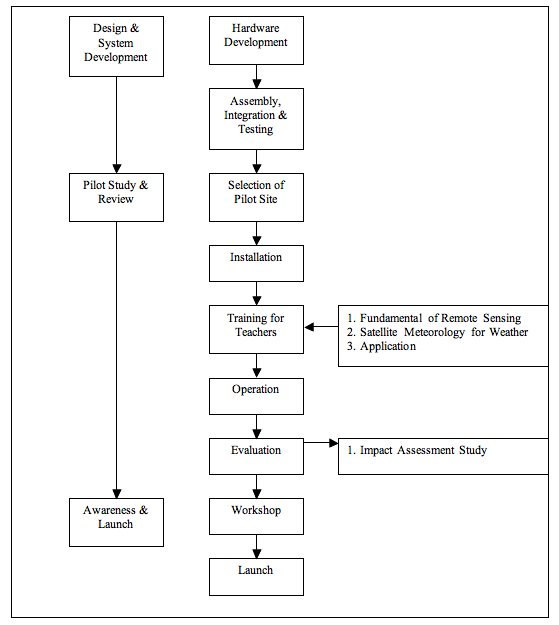 As this paper is written with the objective of showing the general overview to introduce the system at educational level, the various applications mentioned above would be derived after the acquisition of the data and covered thoroughly in the later stage of the program that would highlight not only the exploitation of the data, but, understanding the basics of remote sensing, NOAA sensor systems and capability of bands for remote sensing utilization. Nevertheless, the feasible applications were mentioned briefly here with the intention of creating interest by showing what could be learnt and applied to benefit not only at educational level but for various operational applications too. Upon the successful pilot study, an awareness program of EGRS for schools will be organized. The objective of the awareness program is to allow the selected schools during the pilot study to share the experience of using EGRS for other schools to enjoy the benefit of using space related technologies in creating interest in innovation and scientific environment at school level. Hence, the awareness program would also be a good start to identify schools that are interested in EARS. This might pave a way for finding agencies that can provide funding for educational benefits to schools that are interested in procuring the EARS. The awareness program shall include workshops for the participating schools to provide feedback and finally to produce an impact study report of the EGRS. As the approach to introduce the system to other schools shall be well panned, refinement of any comments shall assess and observed. Only then, installations will be carried out to other interested schools. The awareness program shall be continued by having workshops from time to time to get more feedback on how the EGRS has successfully achieve its objectives. Hopefully, EGRS can achieve its objective in creating interest in innovation and scientific environment by providing gizmo in kits form for students to assemble a micro ground receiving station in school and enabling the reception of NOAA weather satellite imagery data in real time at their finger tips. The introduction of EGRS will not change any of the school syllabuses but provides VAPs to complement some of the school subjects besides acting as catalyst to introduce other innovative products related to space related technologies. Although, in this paper, EGRS is aimed to be introduced at school level, it would also be good to introduce EGRS at tertiary level as a way to complement the remote sensing subject for better understanding of its fundamentals. The system will also benefit various agencies which are involved in remote sensing applications of the environment. Finally, the educational system will pave the way for school children to understand the importance of remote sensing and the imaging satellite program of the nation such as the RazakSAT, the second remote sensing satellite after the TiungSAT-1 which was launched on September 26, 2000. As Malaysia would launch the RazakSAT by September 2008, thus, by introducing the system, we are creating the future beneficiaries of remote sensing data in ensuring the data is being exploited and the satellite program is a success besides creating sustainability in space related technologies and programs. The authors would like to acknowledge Axis Commerce (M) Sdn Bhd for providing the EGRS to KLIUC. Berman, E. A. (1991). Teacher’s Guide for Using APT Satellite Imagery to Teach Science and Math. National Oceanic and Atmospheric Administration (NOAA), U.S. Department of Commerce. Tri-Space, Inc. MC Lean, Virginia. Jensen, J.R. (1996). Introductory Digital Image Processing: A Remote Sensing Perspective. 2nd ed. Prentice-hall, USA. United Nation (2003). “Remote Sensing and the Geographic Information System – Education Curriculum”. Regional Centres for Space Science and Technology Education. New York.